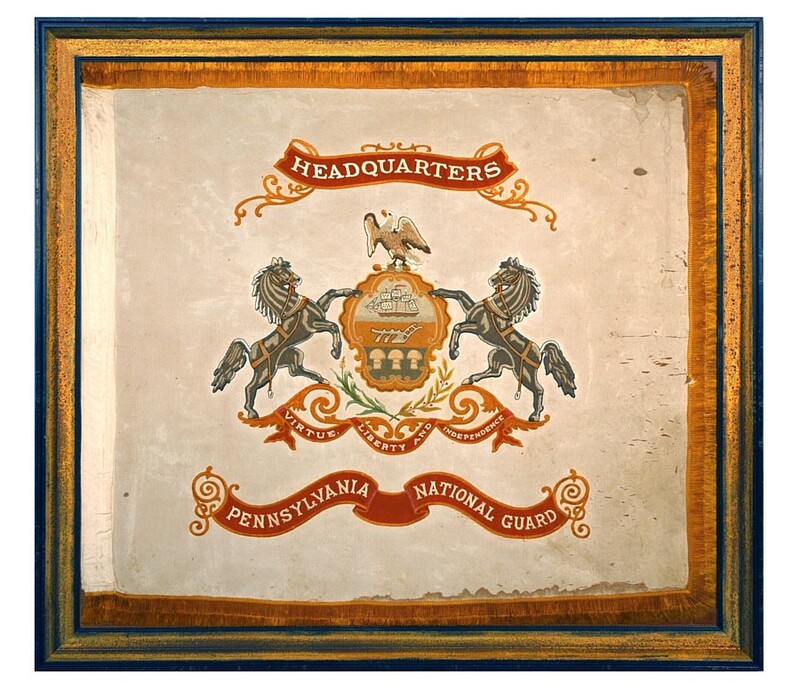 Frame Size (H x L): 51.25" x 56.25"
Flag Size (H x L): 45" X 50"
In 1870, the First Troop, Philadelphia City Cavalry and its many predecessors that constituted the Pennsylvania militia, were officially re-named as the National Guard of Pennsylvania. 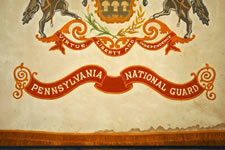 That remained its name until it reorganized again in 1921 as the Pennsylvania National Guard. 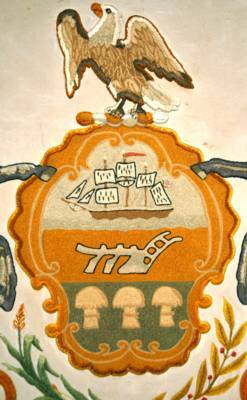 This elaborately embroidered silk banner has the white background that signified that it was a headquarters flag, which likewise served as the flags of the commandant. It would represent one of the first flags made after the 1921 reorganization, and since it is very unlikely that a 1930's flag, made during the Great Depression, would be so expensive and elaborate, it is most likely that it wasn't produced after the 1920's. The construction is silk embroidery on a silk ground, with silk fringe, which is common military construction for this period. 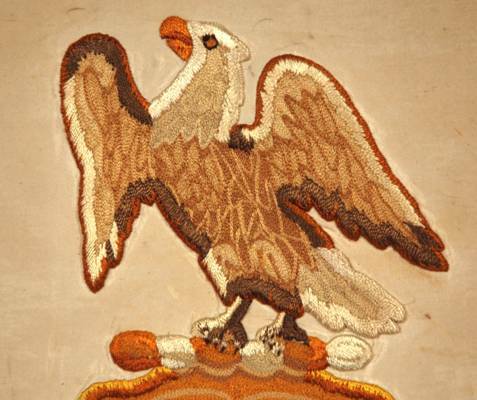 The quality of the embroidery is quite exceptional, as is the fine silk fringe which is much nicer than that which is found on many flags made after 1876. 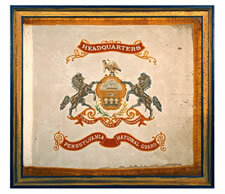 Early state banners are extremely rare, especially with known history of use, which, past the decorative value of this particular example, makes it even more interesting than a traditional Pennsylvania State flag. Mounting. The flag has been placed behind u.v. protective plexiglas. 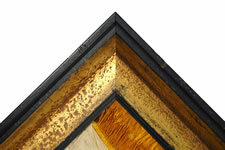 The frame is a black and gold, painted, hand-gilded and distressed Italian molding. Condition: There is minor breakdown in the weighted silk. 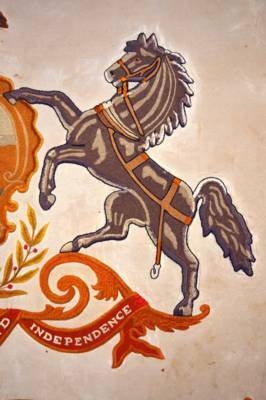 While it is unfortunate that the flag was glued to masonite, the support provided by the mount has kept the flag in rather excellent condition, preventing the type of loss typically associated with early flags that have heavy embroidery on lightweight silk. The glue does not appear to have affected the color of the flag, and may have actually acted as a protective barrier between the masonite and the flag.